Since the very latest iOS 7 update we have tried our best to keep sharing iOS 7 tips and tricks with you. Be it about Parallax effect, desktop-level multitasking, setting a song as alarm tone, or simply using the best features of iOS 7. We have also shared with you various iPhone tips on iOS 7. This guide is also one of those to help you get through the iOS 7 on your iPhone. Relevant read: How to Improve iOS 7 Battery Life – Tips for Both iPhone & the iPad! Before iOS 7 update, you could simply delete a text message by using the Edit icon on the upper right corner. That icon has now been replaced with Contact icon in iOS 7. To delete text message in iOS 7, you can delete an entire conversation by swiping to the left. How to delete an specific message within a conversation is a bit different though. 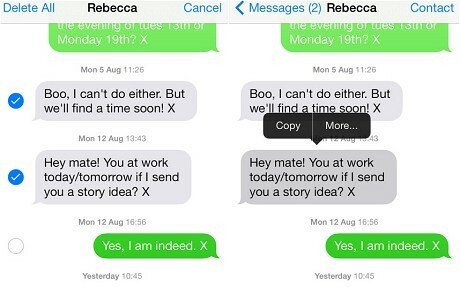 In any text conversation from an individual or a group, tap and hold on any one message bubble. Tap on more… to get a blue circle to the left of all your messages in that thread. You can now check any specific message that you want to delete. The one that you had initially tapped on during first step will be by default selected with a white checkmark sign. After selecting your text messages, tap on trash icon in the lower left corner of your iPhone. When you hit the trash icon, you will see a Delete button sliding from the bottom. Hit and ta da! You can also forward the selected messages to a contact. Rather than hitting the trash can in lower left, tap on the share arrow on the lower right corner. Which means, using this method you can actually perform two tasks: delete selected text messages in iOS 7 and forward selected messages to any contact.